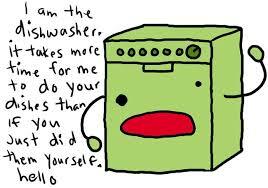 When I was teenager, we didn’t have a dishwasher — well, not besides me and my sister — and it was mostly me. I’m not sure why we didn’t have one, we certainly had all the other major appliances — no one was washing clothes by hand out in the backyard or anything like that. Like this — but sheets! 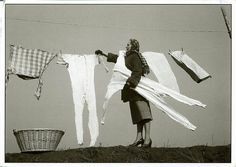 But, come to think of it — we did have a dryer, but unless it was the dead of winter, we hung our clothes outside on the line. Nothing like the sheets – the ones that froze solid before they dried — that could stand up by themselves! Those were fun to fold. I have a suspicion that it might have been a first generation immigrant thing. Dishwashers were for those Canadians. Why waste your hard-earned money on them? You (or more likely the females in your family) could do them much faster anyway. I didn’t live in a place (for very long) with a dishwasher until I was 25 years old. My first house was pretty basic: a fridge, a stove and a giant old-school microwave. No washer or dryer — we had no space for them — and certainly no dishwasher. It’s been a long time since I was 25 and I am now familiar with them. Familiar — not friendly. This is not us after a lovely dinner. Much to the amusement — and perhaps veiled vexation of my beloved — I’ll wash and dry dishes by hand before I think to put them in that stainless steel contraption. I am getting better. I have loaded and unloaded the dishwasher 4 times in the last week. I’ve also washed things by hand about as often. 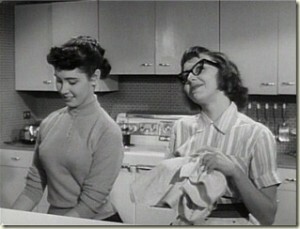 But the kitchen is always “spick-and-span” as my late Mother used to say. She’d be proud — plus she was a bit of a lovable kook, too.